Mansur had begun his illustrious career during Akbar’s reign (1556-1605). His work is found in some of the pages of the V&A's Akbarnama. He continued to work in the royal library under Jahangir (r. 1605-1627), and was with other artists who accompanied the emperor in his frequent travels across the empire. Jahangir gave him the title Nadir al-‘Asr, or Wonder of the Age. Only he and one other artist, Abu'l Hasan, are recorded as having been honoured in this way. Mansur was particularly famous for his studies of birds, animals and flowers. 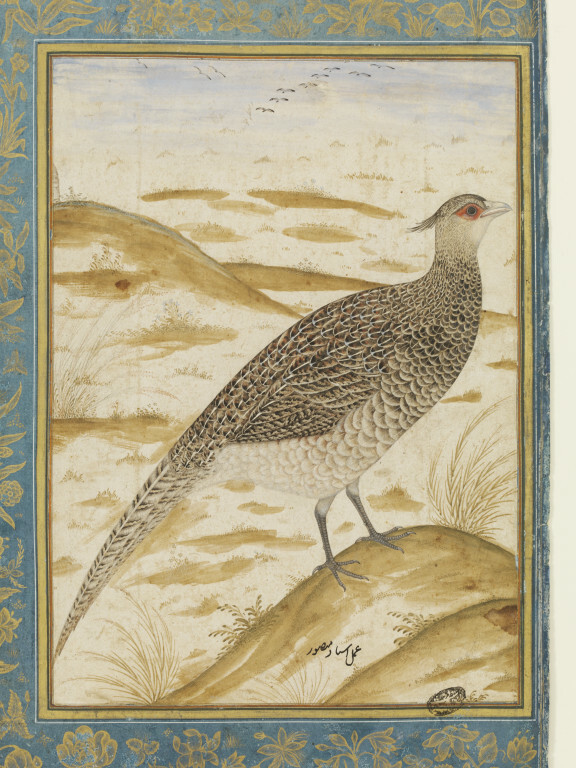 The Himalayan Cheer Pheasant may have been seen by the artist in Kashmir, a province which Jahangir loved and frequently visited, especially in the last years of his reign. The borders of densely arranged gold flowering plants on indigo-dyed paper probably also date to the reign of Jahangir. 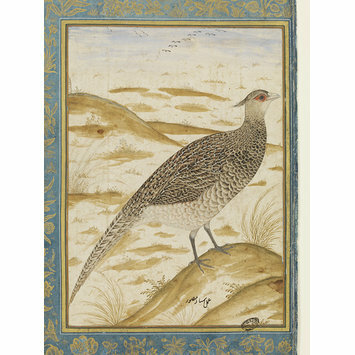 Painting, in opaque watercolour, watercolour wash and gold on paper, depicting a Himalayan Cheer Pheasant perched in a natural landscape; ascribed to Mansur. Indigo dyed borders filled with flowering plants in gold. Asok Kumar Das, Wonders of Nature. Ustad Mansur at the Mughal Court, The Marg Foundation, Mumbai, 2012, pp. 122-3 and figure V.51.